Human history is marked by the expectation of the coming of the Savior. This is made explicit in the prophecies of the Old Testament. A descendant of Adam and Eve would crush the tempter whose voice they had heeded instead of their Creator’s. That descendant, of course, is the baby born in Bethlehem who defeats the evil one through His life, death and resurrection. The prophecies of Isaiah also point to the coming of the Savior. Yet, not just these prophecies and others build expectation of the coming of the Savior. The Old Testament in its entirety is pregnant with this expectation. The miraculous events of both rescue and judgment – such as Noah’s ark in the flood and the deliverance of Israel through the parting of the Red Sea – point to the Great Rescuer from sin. The worship by God’s Old Covenant people -- the tabernacle, the temple, the Ark of the Covenant, the priests, the sacrifices – point to the Ultimate Priest and Sacrifice through whom we worship God. The heroes – such as Joseph, Moses and David – point to the True Hero of all. 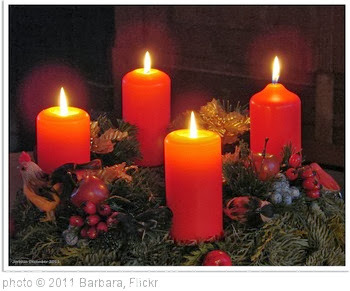 Advent is a time for remembering the promises of God regarding the coming of the Savior. And it is a time of expectation – not only for Christmas Day but for another coming. We await with expectation the Second Coming of our Savior, a coming in which His rule over all will be revealed. To worship faithfully with other Christians who are part of the same church family is a battle -- a battle we seem to fight with our culture and ourselves. Some of us are old enough to remember when our society carved out time from business, sports and other enterprises in deference to Christians who gather to worship. That time is long gone. The church is not dependent on the culture for its help. The church must be the church. Sometimes that means doing things that are counter-cultural. 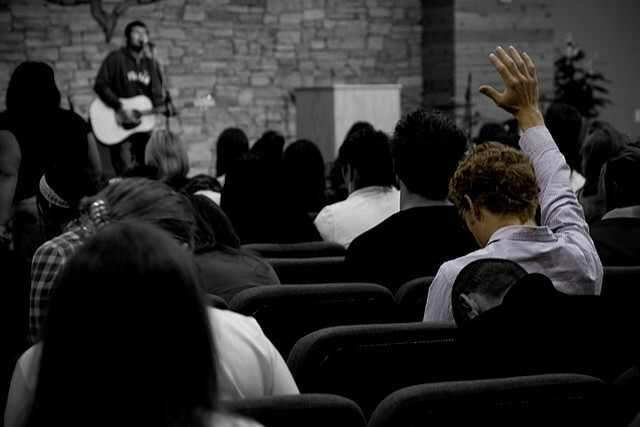 Increasingly, worshiping publicly with a church family is counter-cultural. By merely leaving our homes Sunday after Sunday to worship a crucified and risen Galilean, we are giving witness to the value of Jesus the Messiah in our lives. Yet, we struggle with ourselves, it seems, to value that corporate gathering and to esteem our fellow Christ-followers the way the New Testament demonstrates we should. -- Do I and the other members of my household consider Sunday's worship as a church the most important gathering we will participate in during the week? 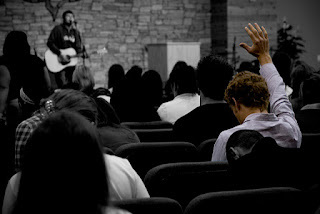 -- Do I recognize God awaits and desires my presence to worship Him as part of His redeemed community? -- Do I realize Jesus has rescued me so that I might be one of the "true worshipers" (John 4:21-24), including in the weekly gathering of the church He has founded and is building? -- Do I regard my brothers and sisters in the church as more important than myself, recognizing my presence is a first and indispensable step in the New Testament charge to encourage and "stimulate one another to love and good deeds" (Heb. 10:24)? -- Do I cordon off the time my church meets for worship to prevent other activities from intruding? -- Do I schedule my Saturdays so that I will be rested for full participation in worshiping God with His people? I realize there are exceptions to every general rule. This is not an attempt to establish rules for our church. Grace still rules in our fellowship. Christianity is much more than corporate worship. But it is not less than faithful corporate worship. Why do children of the Reformation retreat to Rome? Since we are not far removed from Reformation Day, it might be a good time to ponder a question that puzzles me: Why do children of the Reformation retreat to Rome? In other words, why do evangelical Christians convert to Roman Catholicism? It happens periodically with well known evangelicals. During the last two decades, the list has included Supreme Court Justice Clarence Thomas, Kansas Gov. Sam Brownback, author and Baylor University professor Francis Beckwith, young pro-life leader Lila Rose and, most recently, USA Today columnist and Fox News contributor Kirsten Powers. Many are hungry for roots, a sense of history that they don’t feel in the new church plant down the street that seems to mainly want to hide its connectedness to any tradition. Piper's critique of the practices of some churches is strong but would appear to be on target in parts of the evangelical world. He closed his assessment with this encouragement to evangelicals: "Let’s pour our lives into the true evangelical doctrines and grow churches that are strong and rich and serious and relevant and powerful and biblical and that overcome the weaknesses that have pushed some people away." Fortunately, God has provided a fresh wind among evangelicals during the last two decades or so. Increasingly, churches are being serious about corporate worship, theology, expositional preaching, ecclesiology, and community. Young men are planting churches that demonstrate the same marks. -- Scripture alone is our final authority, not Scripture plus an individual, council, church, tradition, experience or document. -- Christ alone is our mediator with God, not Christ plus any human righteousness or accomplishment. -- Grace alone is the way of salvation, not grace plus any human work or method. -- Faith alone is the means of justification, not faith plus any human merit or infusion of Christ’s righteousness. -- The glory of God alone is the purpose of life, not His glory plus that of any other.